Black Whole for Whales was a solo exhibition in Bordeaux, in 2017. Daniel Firman took over the Submarine Base of Bordeaux, which he perceived as “an out-sized architectural landscape”. He made it the base of his reflection and used it as a physical support for his works. He presented three new monumental works, using three distinct areas of the Base to create three genuine experiences. Outside, on the east-facing side of the building, he installed a 60m-long neon, Something Strange Happened Here, specially designed to the dimensions of the site. With this purple 1820 neon, he composed a visual synchronisation with the natural spectrum of colours and lights that are so characteristic of the south-western summer at dawn and dusk. In these transitional moments, the neon gradually revealed itself and gained in intensity with the ambient light. 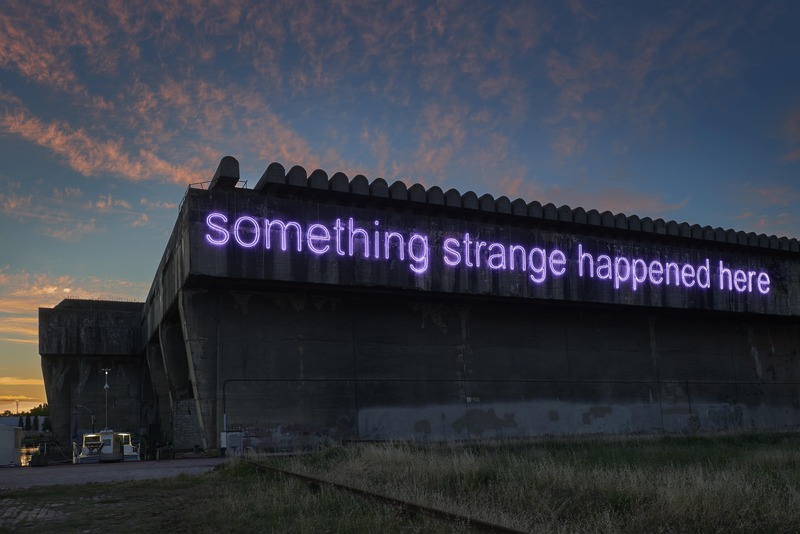 The notion of “strange” in the sentence questioned the psychic relation of the spectator with his/her surroundings, his/her rapport with the submarine base, the docks and the exhibition space. The Submarine Base became the interrogative support of its urban landscape. The second work, Black Whole for Whales, the title piece of the exhibition, was a sound installation which promised to be the boldest piece. Daniel Firman chose to add neither visual nor physical forms nor lighting, and to leave the areas of the Base completely bare in order to heighten its dark mightiness and lend even more depth to its murky waters. The soundscape, a combination of whale songs and notes played by a string quartet, occupied the entire space. The very long and narrow wet docks entered by analogy into a formal relation with the absent marine mammals. Black Whole for Whales intended to be an itinerant experience between an architectural and an underwater landscape. The whale songs drew the spectator towards the third work of the exhibition, as they gradually evolved into a written musical composition. The spectator then discovered a sculpture/show/exhibition, Suspended Chord, in a black cube. The work was lit by a tracking spot, like a dancer moving around a dark stage. A stuffed elephant stretching upwards hanging from the ceiling by its trunk, was drawn into a slow rotation, as though it were floating above the ground. The music composed in collaboration with Guillaume Gesquière (a French composer based in New York) used a “suspended chord” which lent a melancholic dimension to this strange choreography. The chords used for Black Whole for Whales were interspersed throughout, and so the two largest mammals in our world were united, each one positioned above and beneath the water line. Daniel Firman continually plays with perceptions and feelings, reversing their order and opposing them. Suspended Chord closed the trilogy of movements conceived by Daniel Firman with an elephant touching one of the three architectural planes, the synthesis of the cube: the ground with Würsa (18,000 km from Earth), the wall with Nasutamanus, and lastly the ceiling with Suspended Chord. 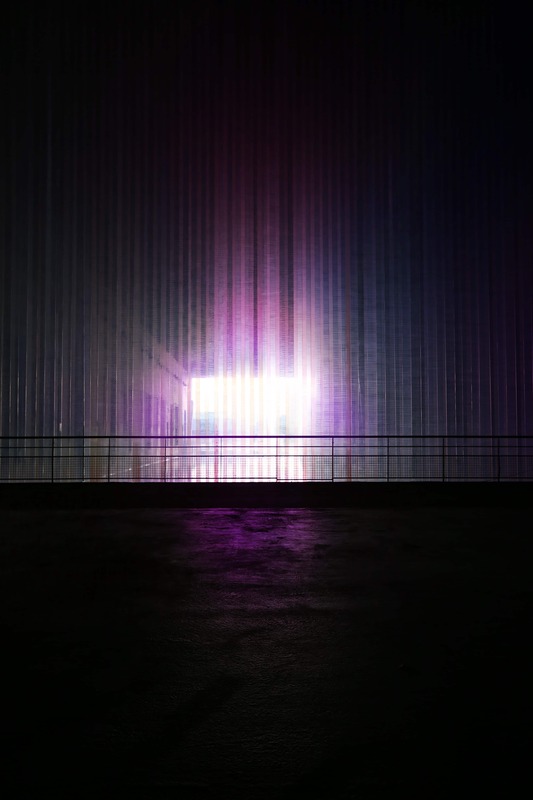 These three monumental works, specially created for the Bordeaux Submarine Base, offered an exhibition that translated the variety of media that Daniel Firman has always used in his art: word, sound and sculpture. He plays on the emotional ties and the physical implication of the spectator in the interpretation of the work. The exhibition works went hand in hand with the use of darkness to create a flaw in the beauty of the summer light: firstly, Something Strange Happened Here through its transition from day to night; then Black Whole for Whales with the darkness of the docks transformed into abyssal pools for whales, and finally Suspended chord, where an elephant illuminated in musical darkness was suspended in isolation.